Monarchs seemed more common this past summer, but it's been a long wait for a status report on their numbers where they overwinter in the mountains of Mexico. This past week, Monarch Watch finally posted some data, confirming our impressions here in New Jersey. The population is two and a half times larger than a year ago. That's the good news in Mexico, as the time for them to begin migrating northward in March approaches. West of the Rockies, however, the population with its traditional roosts in Pacific Grove and elsewhere is in jeopardy. This monarch's perching on a swamp milkweed plant. 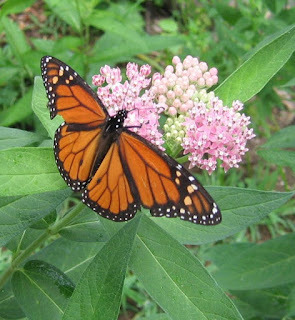 You can tell the plant species by its leaves, which are softer and more narrow than the common and purple milkweeds. Though the monarch larvae require monarch foliage for food, the adults feed on a wide range of flowers, including the buttonbush in the first photo.